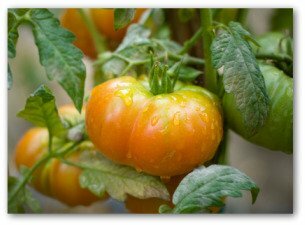 Check out our best tips for growing Brandywine tomato plants when home vegetable gardening. 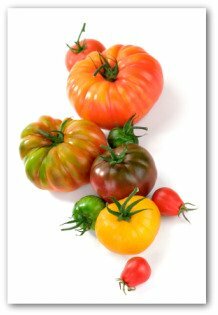 Brandywines come in many delicious and colorful varieties, including red, pink, orange, yellow and black tomatoes. Learn how to plant, care for, and harvest this delicious heirloom tomato in your backyard or container garden. Known as one of the most popular heirloom cultivars in home vegetable gardens throughout the USA, the Brandywine has a luscious taste and eye appeal as well. The large sized fruit ripens in 90 days. It is one of the longest-growing to maturity tomatoes on the market. The indeterminate vine plant has potato-leaved foliage and grows an average 3 to 9 feet tall. 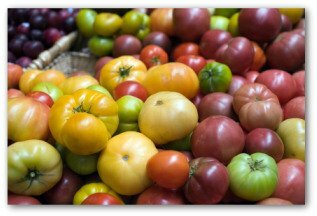 The red, orange, pink, yellow or reddish-black Brandywine tomatoes the plant produces can weigh up to a pound and a half each. The Brandywine is sought after for it's flavor and texture, rather than it's durability or being able to withstand long-distance shipping. The Brandywine tomato is among the largest of cultivated varieties of tomatoes. Ready-made tomato cages can be purchased at any garden center. Support growing tomatoes on trellises constructed using sturdy wire strung between posts. Plant on one side of the structure and weave binder twine through the wire to tie up the stems as the plants grow. 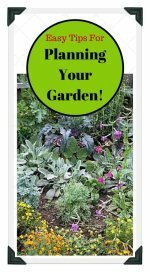 Pruning is recommended for a few vines in a small vegetable garden. As in quality versus quantity, you may get fewer tomatoes this way but the ones that are produced are much nicer. 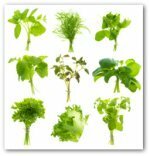 The extra work of trellising is always worth the effort because it decreases the incidence of splash-borne blight diseases and it increases the attractiveness of your growing Brandywine garden beauties. Cut back on staking and supporting time by corralling your tomatoes if you have a great deal of plants to stake. Begin by setting stakes every 10 feet along the row where you plan to plant tomatoes. Then set out plants two feet apart down the row. Rather than tying the plants to the stakes, rope them in using rolls of seam binding that you can purchase from a sewing supply store. Baler twine or old torn sheets also work well for roping in the tomatoes. 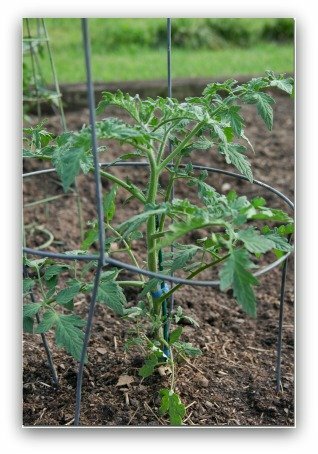 As the season progresses, add layers of binding higher up on the stakes to keep Brandywine tomato plants erect as they grow taller. Tie the roping material of your choice onto the first stake in the row. Extend it down the row on one side of the plants to the next stake. Wrap the rope around the stake, leading it out on the opposite side of the plants. Continue extending the rope down the row on this side of the plants to the next stake. Keep going in this serpentine pattern to the end of the row. Make the return trip back up the row, working on the opposing sides so that the plants are enclosed on either side. Seeds that are enclosed in fleshy pulp like tomatoes need special treatment to dry and store. The pulp needs to be separated from the seeds by fermenting the fully ripe vegetables. Since you will want to share Brandywine seeds with your neighbors to help preserve heirloom seeds, we included a tip for drying and storing seed properly. Slice the tomato down the middle. Put them into a clean wide mouthed glass jar. Add about ¼ cup of water to the jar. Let the jar sit in an out of the way place for a few days at an ideal room temperature of 80 to 90 degrees F.
Stir the mixture a couple of times daily. When you see bubbles rising or when most seeds have settled to the bottom, stop the fermentation process by adding water to double the mixture. Good seed will sink to the bottom. Rinse the seeds and place them in a glass dish or window screen to dry. The warm wet conditions present after fermentation are perfect for sprouting seed. If you ferment too long, you will end up with sprouted Brandywine tomato seed! By saving seeds from your best crops season after season, you develop a productive new plant that is well adapted to your local conditions.